Iron Man 2 sets a high bar that will most likely not be met by another movie this summer. Made for everyone, especially fans of the first Iron Man movie. There is absolutely no reason for the mixed reviews that Iron Man 2 is receiving. Some critics are claiming that Iron Man 2 suffers from a poor screen-writing, saying that there is not enough Iron Man in Iron Man, that the story is full of holes and that everything the first Iron Man film got right is completely wrong here. Forget those reviews. They are filled with false accusations. Iron Man 1 was not perfect. Neither is Iron Man 2. But it exactly what any fan of Iron Man wants to see. It is Iron Man 1 on steroids. Iron Man 2 picks up right where Iron Man 1 ended – Tony Stark (Robert Downey Jr., Sherlock Holmes) admits to being Iron Man in a press conference – only we don’t see it from within the press conference, we see it on a tiny television screen in a run-down apartment in Moscow. Iron Man 2 immediately introduces us to its powerful villain, Ivan Vanko (Mickey Rourke, The Wrestler). Vanko (also known as Whiplash), who has a generation-old vendetta against the Stark family, simulates Stark’s arc reactor (the light in his chest that fuels the Iron Man suit) and creates a whip-like weapon that rivals Iron Man’s suit. Things only go downhill for Stark when his business nemesis Justin Hammer (Sam Rockwell, Frost/Nixon) hires Vanko to build a robotic army to bring Iron Man down. What made Iron Man such a success was its perfect blend of action, comedy and likable characters. Because it was an origins story, there wasn’t much of plot. Its flaw was the final act where it threw in a bad guy just to give the film a climax. But every film needs a climax, so that mistake can be excused. Iron Man 2 suffers from two small problems, but much like Iron Man 1’s problem, these were both needed for the film’s sake. One involves a seemingly unnecessary friendly fight that feels like it belongs more in a Spider-Man movie than an Iron Man movie – but it serves its purpose. The second consists of several congruent scenes that feature Samuel L. Jackson (who made a post-credits cameo in the first Iron Man) as S.H.I.E.L.D. leader Nick Fury. At the 2010 Sundance Film Festival, Jackson told The Reel Place that he had just wrapped up re-shoots for Iron Man 2. These were obviously those scenes. 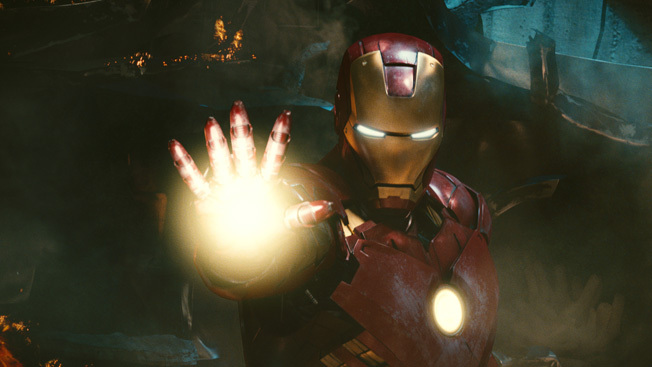 Barely being tied into the plot of Iron Man 2, their purpose is to connect the Iron Man character and story to the upcoming Avengers film, slated for release in summer of 2012. These scenes form the tiny holes in Iron Man 2’s plot that other critics are citing. But as they are necessary for building Marvel Studio’s film franchise, it can also be excused. Many reviews are claiming that there are too many players and too many storylines clogging Iron Man 2. Wrong again. Don Cheadle (Hotel Rwanda) takes over Terrance Howard’s (Hustle & Flow) role as Rhodey from Iron Man 1. Scarlett Johansson (Vicky Christina Barcelona) plays Natalie Rushman, Stark’s new secretary. Rourke plays Vanko/Whiplash. And Rockwell plays Hammer. Replacing one actor and adding three new characters isn’t hard for an audience to deal with in a sequel. Since we already know all of the other characters, it is easy to learn three new ones. As for storylines, every subplot – with the exception of the Nick Fury/Avengers one – serves its purpose for the story. Good filmmaking never shows you anything that isn’t relevant to the story at hand. Neither does Iron Man 2. Adding a little more complexity to the franchise is a good thing. If you liked Iron Man, then you will like Iron Man 2. If you loved Iron Man 1, then be prepared to love Iron Man 2 even more. In many ways, it is superior to Iron Man 1. The stakes are raised, there are moral conflicts, the action is heightened, it is far more intense and it looks absolutely amazing. Opening the summer blockbuster season, Iron Man 2 has set a bar that will most likely not be matched by another. Note: Stick around until the end of the credits for another short Avengers tease. And some scenes that appear in the Iron Man 2 trailers are absent in the film.